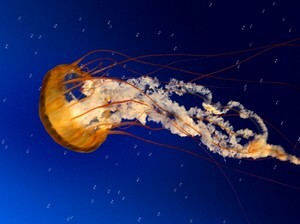 Can you imagine how deep this beautiful crystal and gold jellyfish is swimming? The water is so blue you just know it is cold. You can watch from the safety and of your desktop and warmth of your room adventure.